If you’re in Istanbul over the next few days look out for the latest iteration of the artist’s international series…. 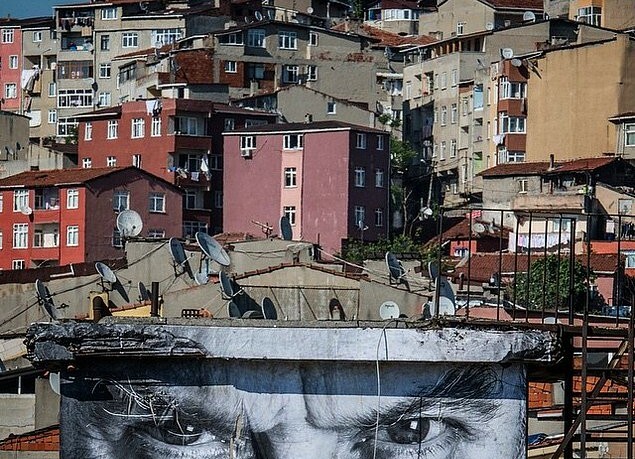 Some cities seem like they’re just made for the art of JR. Istanbul, for example, is an ancient settlement with diverse population, where bright new tower blocks rise up beside worn-out social housing. What’s more, it is founded on seven hills, and has the kind of views and vertical facades just crying out for one of the artist’s paste-up portraits. JR first began the series in the autumn of 2008, in the Spanish naval city of Cartagena, and has since extended the project to Shanghai, Los Angeles, Havana and Berlin. The project, like many of the artist’s other works, involves photographing a conurbation’s inhabitants and pasting up these portraits on suitable sites. Yet rather than looking at, say, disaffected youths or opposing religious groups, JR’s Wrinkles series focuses on a city’s older population, posting senior citizens’ portraits in cities around the world where “wrinkles”, human as well as architectural, can be found. JR only began his Istanbul project a day or two ago, but it’s already looking good. Turkey’s biggest city is also a fertile choice for JR, given the social unrest in Taksim Gezi Park in 2013. The country is preparing for a forthcoming general election on 7 June, with the reactionary Justice and Development Party of ruling president Recep Tayyip Erdogan odds on for re-election. JR’s project is perhaps unlikely to tip the electoral balance, but it’s great to see a little artful, civic insurrection in the city at this moment. Check out JR’s Instagram account for more, and check back soon for news of our forthcoming JR book. And for more great art outside the gallery system take a look at Wild Art.